TSTI Digital Certification Badges | TSTI | Teaching Science and Technology, Inc.
Open or digital badges are web-enabled versions of a credential or certification which can be verified online. They allow you to share your qualifications in real-time via a variety of platforms and social media. TSTI verifies your credentials and partners with Credly’s Acclaim platform to issue you a badge to share embedded in your resume, through social media, on your web page or via email. Communicating your credentials in an ever-expanding online marketplace can be challenging. 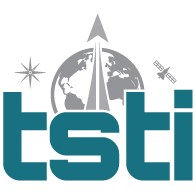 TSTI understands that digital badges are trusted by colleagues, employers and your peers in the space industry and wants to provide you with the tools necessary to achieve your professional goals. How do I earn a digital badge? To earn the Certified Space Professional Badge you need to complete TSTI’s Understanding Space course (either online or in person) or NASA’s Foundations of Aerospace and pass the final exam. If you have already taken the course, see our FAQ. Register for the online course here. Click on the badge to display verified information, such as the skills learned, the steps needed to earn it and the issue and expiration dates. Web sites, emails, social media, anywhere you can add a hyperlink. The cost of the course with the digital badge is the same as without it. Based on your skills, you can search and apply for job opportunities right through the Acclaim platform. Score 80% or higher on the final exam. Receive an email with a link to the badge. Click on the link in the email to set up an account with Acclaim. Claim your badge and start sharing!